Dr. Fine has incorporated his passion and professional singing and songwriting musical skills into the public educational programs of the Intestinal Health Institute. The first of these is "Get on a Mission of Nutrition", a multimedia educational campaign that teaches children healthier lifestyles. Americans of all ages are experiencing a nutritional crisis, which can be seen in increased obesity and obesity-related diseases, such as cancer, diabetes, hypertension, heart disease, strokes and degenerative arthritis. The saddest manifestation of this trend is the epidemic of obesity in children. Study after study has documented this public health crisis. In order for America to be healthier in the future, we must teach our children to live and eat healthier today. Research has shown that lifestyle habits can be optimally impacted through education between the ages of 5-12 years. 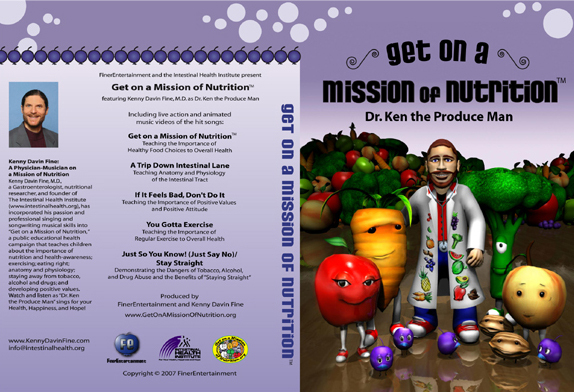 "Get on a Mission of Nutrition", which is geared to grade schoolers and their parents, teaches kids about nutrition and healthy living in a fun, easy-to-learn way. It promotes and educates on nutrition and health-awareness; exercise; eating right; anatomy and physiology; staying away from tobacco, alcohol and drugs; and developing positive values. To make it as fun as possible, the campaign centers around music that Dr. Fine has written and professionally recorded for children that promotes these ideas. To hear a sample of some of the songs or watch an animated music video, click the links below. Five live shot and animated music videos have been produced, and incorporated into a classroom/home school curriculum that is available now! Click one of these links to sample our 3D animated "Trip Down Intestinal Lane", teaching anatomy and physiology of the digestive tract! To go with the CD's and DVD's, many other educational tools are being developed, including a TV show, illustrated printed materials, an interactive web site, and more community events. We will target schools, libraries, doctor offices, grocery stores, recreational and community centers -- anywhere kids frequent. Live performances by Dr. Ken are available on a limited basis, as have occurred in schools and Sciences musuems all across the country. Please stay tuned for announcemenet of our next series of performances, or email us at info@intestinalhealth.org for booking information!